How to Create PDF Files on Mac OS X Handily? Are you searching for a PDF creating program to make PDF file on your own? Well, PDF creators are everywhere. Some of them are really works but some are simulate. 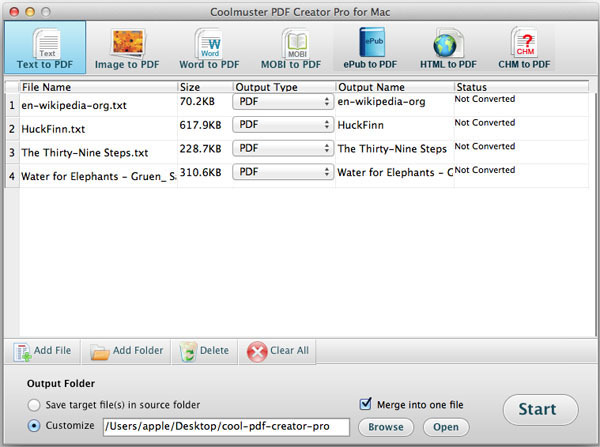 To save your time to find out the most suitable tool by trial and error, we kindly suggest you use Coolmuster PDF Creator Pro for Mac, an all-in-one PDF tool to save various file types as PDF format on Mac OS X. As the best PDF Creator for Mac, Coolmuster PDF Creator Pro enables users to create PDF from almost all popular file formats, such as Microsoft Word documents, text files, MOBI eBooks, images, etc. What you need to do is just importing the files you want to convert PDF into the program and then the smart tool can handle the rest independently. It can perform a batch conversion mode and fully preserve the original text, formatting, etc. How to Convert Password Protected PDF? How to Insert Pages into PDF in 3 Clicks? 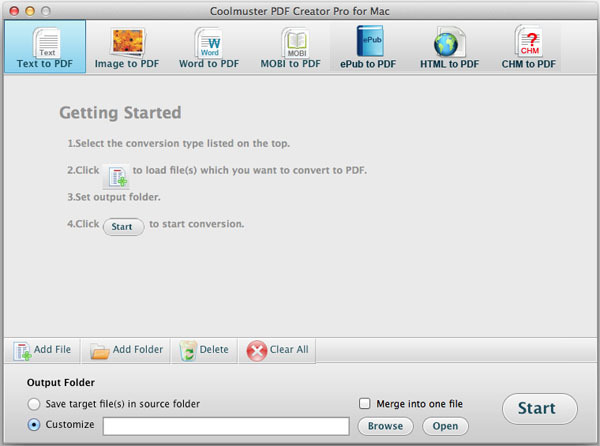 Click the download button to free download this Mac PDF creator. Double click on the desk-top icon of the program to launch it to get ready. Windows version is also available. As I mentioned above, this PDF creating tool provides you with multiple conversion types, such as Word to PDF, Text to PDF, MOBI to PDF, Image to PDF, etc. Choose your desired conversion type and upload the target files you want to convert to PDF. Click the Browse button to customize an output destination for saving the created PDF. After that, you can simply hit on the Start button to let the PDF tool do the rest for you. The creation can be finished soon. You can check the output PDF files in the output folder. If seeing is believing, then free download the PDF Creator Pro for Mac and experience for yourself.